Update: This is an old post that had a link to download a lengthy report that detailed all 5 foods. The report is no longer available due to some recent updates on my site. My apologies. But you’ll still learn about ONE simple food that can improve your digestive health now. Enjoy! One of the biggest barriers (if not the biggest) most people encounter when making dietary changes, especially when it comes to traditional foods, is the time it can take to cook and prepare food. I’m ALWAYS trying to find ways to make the most efficient use of my time in the kitchen. For example, I cook things in bulk, I make multiple jars of fermented foods at once and I make massive pots of bone stock which I freeze and then parlay into quick, simple soups. Still, I understand that not everyone is ready for home fermentation (even though it’s the easiest thing in the world to do) or to start hunting around for chicken feet and beef knuckle bones for homemade stocks. I wrote it for the person who has digestive issues but is not ready for something like the GAPS diet or any other protocol that requires a massive overhaul of one’s current diet and kitchen. These 5 foods require NO COOKING and absolutely NO ADDITIONAL TIME to your schedule but can greatly improve your digestive health. All that these 5 foods require are a new consciousness around food and a change in buying habits. Now it’s kind of a long report – 12 pages to be exact – and a bit too long to include in a blog post. So for the sake of simplicity, I’ll share one of those foods and then I’ll include the link to download the report at the bottom of the post. Eat REAL Pickles. Not Vlasic. See that picture of the dork with the pickle in his mouth (yup, that’s me)? Well, that’s one of the simplest foods you can start consuming to improve your digestive health NOW. But I’m not talking about Vlasic pickles. I’m talking about REAL pickles. Vlasic Pickles (as well as most commercial pickles) are fake pickles and they’re completely worthless for your digestive health. Yes, there’s a BIG DIFFERENCE between real pickles and commercial ones and I’ll prove it with two simple pictures. But first, a little background info. I’m sure you’ve heard of probiotics, right? Probiotics translates as “pro-life” and they are supplements of healthy bacteria that people take to help with digestive issues. Our bodies, both inside and out, are populated with trillions of bacteria and they are heavily concentrated in our digestive system. In fact, there are ten times more bacteria that live in our gut than there are cells in our body. That means on a very physical level, our bodies are actually more microbial than human. But the key point here is not to creep you out. The key point is to understand that these bacteria are vital to improve your digestive health. In fact, not only should we not be scared of them, we need to eat them. Before the age of probiotic supplements, people consumed probiotics in their natural state, from food. That’s right, fermented foods are Nature’s true probiotics and they are staples of traditional diets all around the globe. Fermentation is a natural process by which the starches and sugars in fruits, vegetables and dairy are chemically broken down by naturally occurring bacteria and converted into lactic acid (thus, fermentation is also referred to as lacto-fermentation). Lactic acid is also a natural preservative and prevents spoilage. More importantly these chemical changes have some remarkable health benefits. They are truly super foods with powerful healing properties, especially for digestion. Now let’s understand the difference between real pickles and Vlasic. 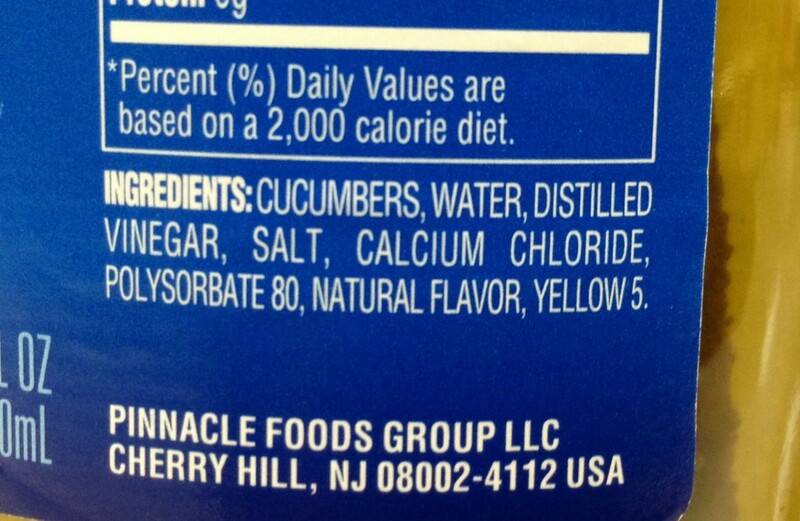 Here’s the ingredients label of Vlasic pickles, America’s favorite pickle brand. The first is the distilled vinegar. The vinegar mimics the sour flavor of naturally fermented foods. In addition, that vinegar was heated when it was added. The heat pasteurizes the cucumbers, thus killing all the beneficial bacteria. It is literally a dead food. Thus, this is not a real fermented pickles product. Heating it allows it to be preserved for years at a time and sit on supermarket shelves and your kitchen shelves for years upon years. That’s great for Vlasic’s bottom line. Not so great for you though. Let’s hit on a few more of those ingredients. “Polysorbate 80” is an emulsifier that keeps the pickles firm. Now from the research I’ve done, this chemical doesn’t seem to have negative effects on human health. 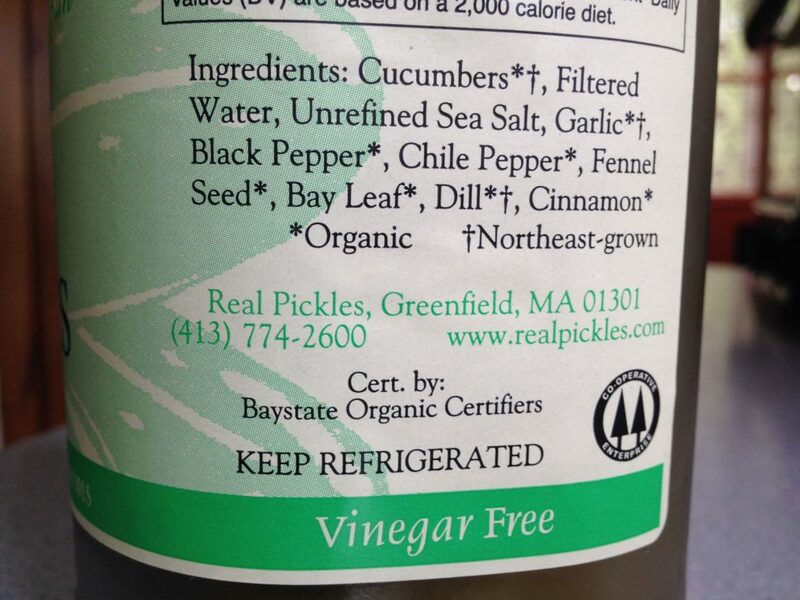 BUT as you’ll see below, real fermented pickles don’t need chemicals, harmful or not, to keep them firm. “Natural flavor” is a legal loophole that allows companies to make their own artificial flavors in labs. As long as the artificial flavors come from natural products (roots, leaves, herbs, etc), they’re legally allowed to say “natural flavors.” Anytime you see those words on any food product, you know it’s really an artificial flavor and therefore a processed food product. Isn’t the food industry just swell? So in the case of Vlasic, they’re using artificial flavors to mimic the flavors of real pickling spices such as garlic, dill and mustard seeds. And finally, “Yellow 5” is an artificial coloring that gives Vlasic pickles an almost neon-yellowish-green appearance. That is NOT a natural coloring to pickles. And this chemical actually does have the potential for negative health effects including allergic reactions and hyperactivity in children. 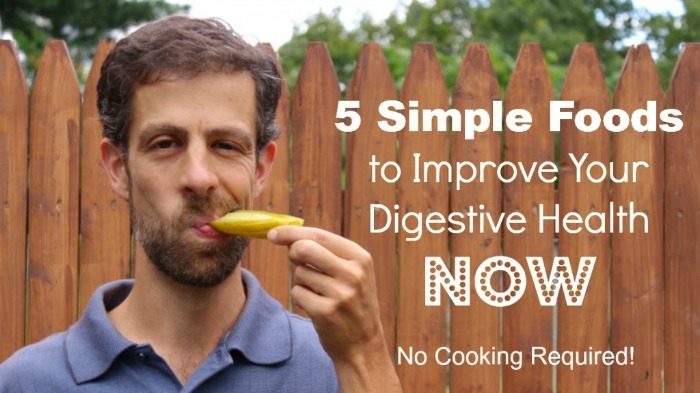 Vlasic pickles may be tasty but they will NOT improve your digestive health. This company is literally called Real Pickles. They’re my favorite local food company here in western MA and they make a fantastic line of organic and traditionally fermented vegetables. Their signature product is of course, pickles! First, notice at the bottom where it says, “Vinegar Free.” Not only is there no vinegar, but there’s no heat added either. In fact, all that’s added is organic pickling spices (not natural flavors) and sea salt. That’s it. And that’s all you need to ferment cucumbers into pickles. The salty brine acts as a natural preservative which will keep the pickles firm (thus no need for polysorbate 80) and allows the beneficial bacteria to convert the cucumbers to pickles, which along the way, increases the vitamin content, enzyme content and probiotic content. These are the types of REAL fermented foods that WILL improve your digestive health. And the good news is that they’re not hard to find in health food stores. Just look for products without vinegar or any nasty chemicals like you’ll see in Vlasic. All you should see on the label is salt, water, the vegetable being fermented and maybe some additional spices and seasonings. You can also learn to ferment foods at home! It’s so simple and I teach all my clients how to do that. But I know, I know. This post is just about the simple things you can do RIGHT NOW. And right now, you can start eating REAL pickles instead of fake ones.